Croatia is a very diverse country when it comes to its climate and geographic characteristics. On a relatively small surface, you can find everything from magnificent mountain tops to mystic swamp areas, exciting waves and wild rivers. So it would be a real pitty not to indulge in Croatia's beautiful contrasts and different possibilities offered by its geographic location. We present to you the list of various water activities available on the Adriatic together with information about the best time to experience them and prices which are, do take into account, only informative. Diving is always exciting, especially considering the fact that the underwater hides an entire world which we easily tend to forget. The popularity of diving is on the rise among the locals and among numerous visitors. Take a peek into the Adriatic underwater in company of professionals or go on an unforgettable deep blue adventure by yourself. The best time to go diving in order to catch fish is the second half of the summer and the fall, whereas the best time to go diving for pleasure is whenever you feel like it. Possibly the biggest shipwreck on the Adriatic sea was the Baron Gautsch's accident than happened way back in 1914. To explore the remains of the ship, you'll set off in the direction of the open sea where visibility oscilates and currents tend to be strong. It's best to begin the exploration of the remains from the ship's stern over the upper deck to the bow. After you explore the ship's exterior, you can enter the upper deck and explore its inside. The hull of the wreck is still well preserved and the hole caused by the explosion is still visible in the middle of the left side. The dive is especially interesting since the wreck is so well preserved. Visibility oscilates and currents tend to be very strong. The ship is under protection of the Ministry of Culture of the Republic of Croatia, and you are allowed to dive only in company of authorized diving center staff. The island of Premuda is belongs to Zadar's archipelago ans is located fathest to the west between the islands of Silba and Škarda. In its underwater there is a system of caves called the Cathedral. Numerous perforations let sunshine through so the inside is well lit and colored turquoise blue. The location can be accessed by ship which moors on the already set buoy. The dive begins with a descent onto a platform and after that you enter the Cathedral. Besides the Catherdal, you can also dive into the tunnel next to the main entrance and dive out to the depth of 16 m.
The Adriatic Sea keeps unimaginably beautiful things under its surface. One of them is most definitely Kampanel – one of the most beautiful locations on the Adriatic. An impressive view of its top in the endless blue space nicely suggests the rest of its wonderous beauty. 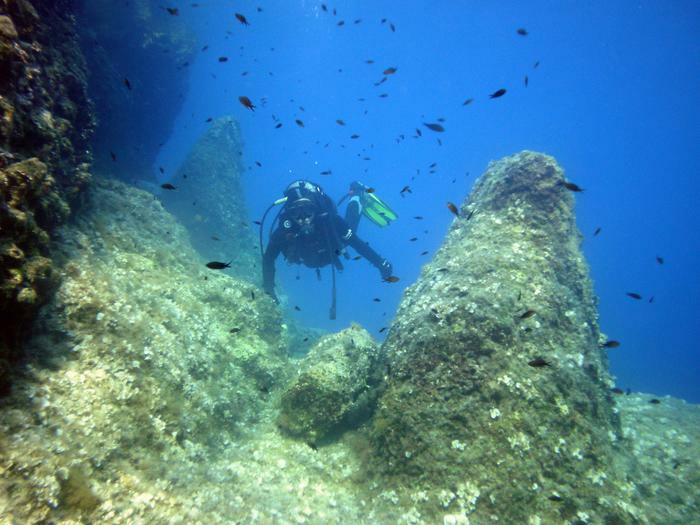 The location can be accessed by a boat, and it is not easy to find, so you can only dive accompanied by experienced divers. The location is home to strong currents, so you should be very careful, especially near the top of Kampanel. Some say the untouched nature is best experienced in absolute peace and silence underneath the starry sky. This is well known to all those who at least once sailed the Adriatic on any kind of a ship. The Adriatic coast has more than 1000 islands and cliffs, and thanks to mild winds, it provides an unforgettable experience of the Mediterranean's best. Sailing in Croatia is very popular among young people who find it a must-try activity when on the Adriatic. Some of the most beautiful beaches in the world and some of the most amazing islands and places are only a couple of sailing hours away. Basically, all that beauty is within arm's reach. You only need to pick one of the already planned cruises or, even better, rent a sailing boat together with a skipper and enjoy making your own itinerary. 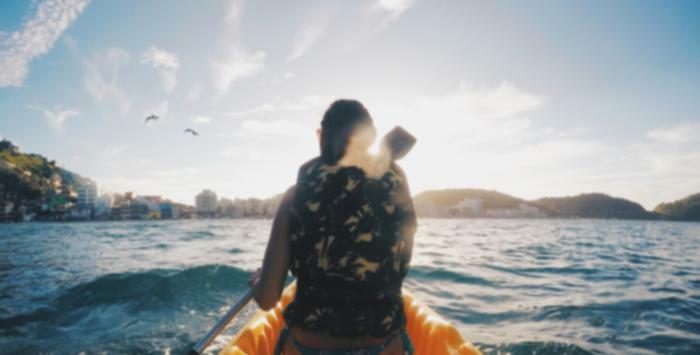 The ideal time for sailing depends on your interests: while some prefer early spring and late fall, others love to sail during winter, but most people still choose summer. Lastovo is a forested Adriatic island which takes pride in its untouched nature and authentic scenery with lots of hidden bays. One of those bays is Zaklopatica located on the north side of the island. It is 2.5 km away from the center and, thanks to its location, offer and surroundings, sailors just love it. When it comes to other bays of Lastovo, we surely recommend Portorosso, Jurjeva luka, Korita and Davjenica. Maslinica is located on the west side of the island of Šolta. The area is characterized by thick forests combined with beautiful bays. Marchi, a restaurant situated in the building built by the Venetian family Marchi in 1703, is a backdrop for a new marina that can take in around 30 boats. On the south side of the island of Šolta you will find a little bay called Šešula which is very popular among sailors for its charm and beauty. Primošten is one of the favorite destinations in the heart of Dalmatia. The closest marina is Marina Kremik only two kilometers away from the town. It is very well protected so it is regarded as the safest and most beautiful natural marina on the Adriatic. Kiteboarding is a water sport which combines wakeboarding, snowboarding, windsurfing, surfing, paragliding, skateboarding and sailing into one extreme sport. Its popularity is constantly on the rise, and it attracts people of all ages. In order to master this sports' key skill, you don't need strenght as much as you need to understand the principles of steering the kite and to have a strong desire to learn and aquire new techniques. 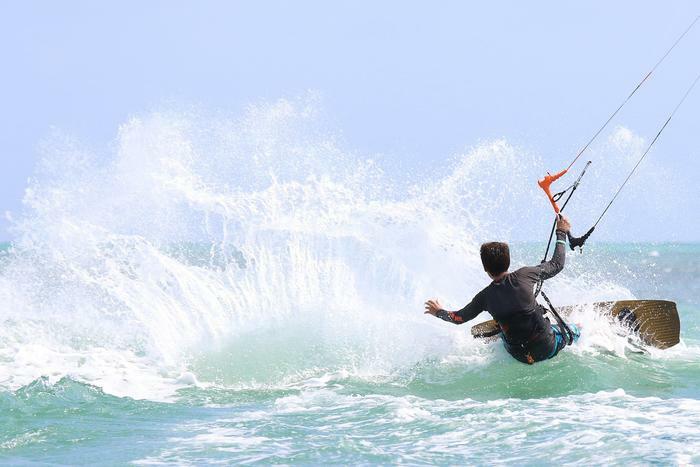 Depending on the location, the best time to go kiteboarding for advanced kiteboarders is the afternoon, while early morning is more suitable for beginners. Viganj is one of the favorite kitesurfing locations among kiteboarding lovers from all over the world. The sea canal between Pelješac Peninsula and Korčula Island combined with the wind that blows there make perfect conditions for this activity. These ideal conditions are the result of Viganj's position on the narrowest part of the Pelješac canal in which the wind has great acceleration. The mistral, with constant mini waves which enable achieving great speeds, ensures enjoyment in this sport during summer. It usually gets windy around noon, and the wind gradually gets more intense which means that the afternoon is ideal for kiteboarding as well as for various competitions. Since there's no wind in the morning, the canal resembles a pond and thus provides a sense of security to beginners and kids. The sand beach with wide entrance to the sea on the Neretva Delta into the Adriatic sea is a perfect spot for kiteboarding beginners. You can get to the beach from two directions. If you're coming from Split, you'll reach a bridge on the Neretva river after Ploče and Rogotina, and after 1 km you'll have to take a left turn and continue straight ahead. Coming from Dubrovnik, you'll reach Opuzen where you'll need to take a turn to Blace and, after 8 km, you'll reach the shore. Sabunike Beach is located only 20 km away from Zadar, a well-known tourist destination. 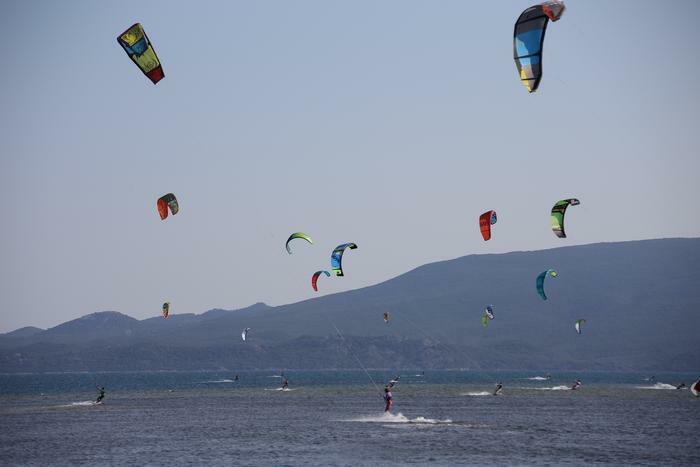 Kiteboarders really love it because of the bora wind blowing from Velebit ensuring ideal conditions, and others love it because it's sandy, wide and nice looking. Besides Bol on the island of Brač, Sabunike beach is the most popular destination among surfers. 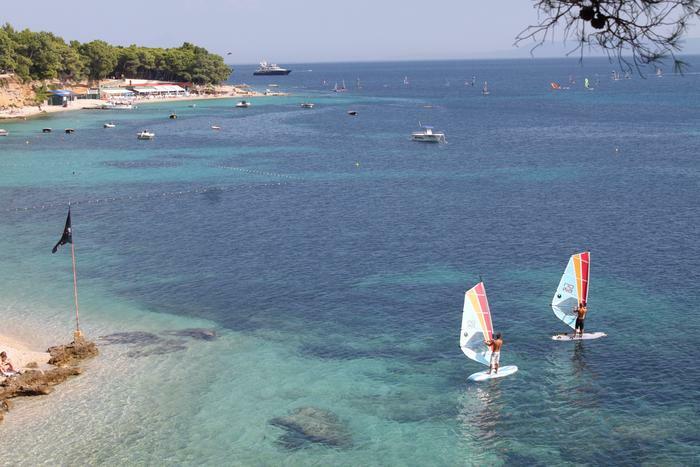 Windsurfing is still one of the most popular water sports, in the world and in Croatia alike. The Adriatic provides the best conditions for windsurfing thanks to the winds – bura, jugo, maestral, tramontana i levant – and the best time to go windsurfing depends on the location and the level of your expertise. Bol on the island of Brač is the most well-known and attractive surfing destination in Croatia. This is partly due to the fact that it's home to the renowned beach Zlatni rat which is said to be one of the most beautiful beaches in the world. A mild levant blows in the morning so the first part of the day is ideal for beginners. Mistral marks the afternoons making them ideal for experienced and professional surfers. In the Preluka aquatorium, between Volosko and Opatija, surfers found their piece of heaven thanks to the winds blowing in a naturally protected bay. The sufers begin surfing in the night and wait for the sunrise and waves created by the north wind – tramontana. The beginning of the fall is optimal for surfing in the Preluka aquatorium. Jadrija, a bathing place near Šibenik, is one of the favorite Adriatic destinations for surfers. Thanks to the mild mistral and tramontana, beginners and intermediate surfers enjoy this location. Strong bora and sirocco of middle strenght in spring and fall provide excellent conditions for professional surfers. Wakeboarding, a water sport less well-known to wider audiences, includes surfing on a wakeboard on the water. Wakeboard is basically a surfing board, but usually square, thin and small. It also has bindings for shoes which are wakeboard-specific. The sport was developed as a combination of skiing, sailing and snowboarding. Wakeboard is run by a motor reaching speeds up to 30 or 40 km/h. Wakeboard can also be run by other mechanisms as well, including closed cable system. Cable parks, that is wakeboard water arenas, usually open in April and close in October. We recommend checking working hours at your destination of choice. Cable park on the island of Krk has eight brackets and is run by electricity. The cable park is 650 m long, and the speed you might reach goes as high as 30 or 32 km/h. Equipment and instructor's help are included in the price. Cable park in Novalja on the island of Pag is one of the most modern systems of its kind in the European Union. It's 600 m long, and it's average height is 10 m which contributes to the excitement this sport exerts. The complex includes a restaurant and a shop where you can get the necessary equipment. Cable park Kaštela was built in 2016. It's 500 m long and located on the Divulje beach, just accross the road from the Split Airport. There is a coffee place where you can also get a bite to eat. Rafting is an interesting recreational activity suitable for groups. It's based on floating on mountain rivers, that is rivers with high water levels, lots of waterfalls and rapids. Groups usually have 6 to 10 members, with at least one experienced navigator who knows the river well. All of the group members need to have proper equipment. Due to some parts of rivers, rafting is considered an extreme sport and can have serious consequences, but it doesn't have to be dangerous or demanding. It provides top excitement in spring and fall. Because of its specific landscape and geographic position, Croatia has amazing rafting locations. Here are three we definitely recommend experiencing. Zrmanja, one of the most wonderous rivers in Europe, is a beautiful part of the untouched Croatian nature. It springs on the south part of the Plješevica mountain, and the closest bigger town is Zadar. During summer, the Zrmanja river is calm and beautiful scenery and unforgettable vistas around you change slowly. On the other hand, during periods of high water levels in spring and fall, Zrmanja is one of the most exciting rivers in this part of Europe. The lenght of the river suitable for rafting: 12 km. Cetina, only a few kilometers away from the sea, guarantees an incredible experience in one of Central Dalmatia' gems: Omiš. 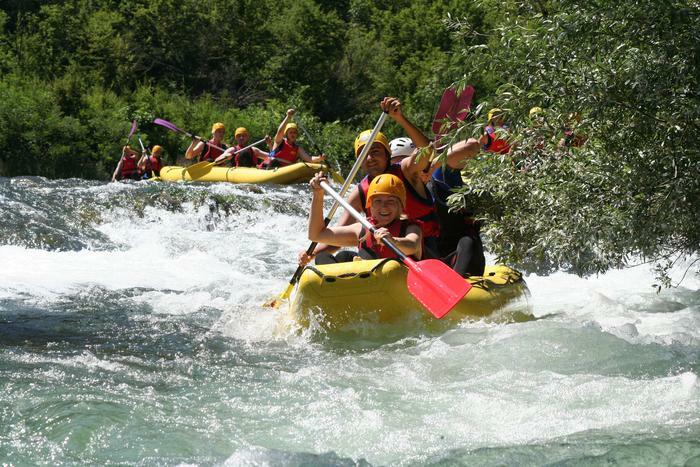 Both exciting and relaxing rafting experience attracts visitors to the protected part of the Cetina Canyon each year. Omiš is a perfect destination for adventure seekers and adrenaline lovers thanks to the magnificent beauty of rivers and mountains, and their contrast in relation to the sea. The lenght of the river suitable for rafting: 11 km. Enjoying a peaceful holiday in Novi Vinodolski can be enriched by a trip to the Mrežnica river only two hours away by car. Rafting on the Mrežnica river is a great option if you're looking for ways to spend quality time with your kids because the river is clear, warm and ideal for learning how to stay afloat when you get to waterfalls. The ideal time to go rafting on the Mrežnica river is during the period of the highest water level: either spring or fall. During summer, the river is more suitable for kayaking. The lenght of the river suitable for rafting: 15 km. 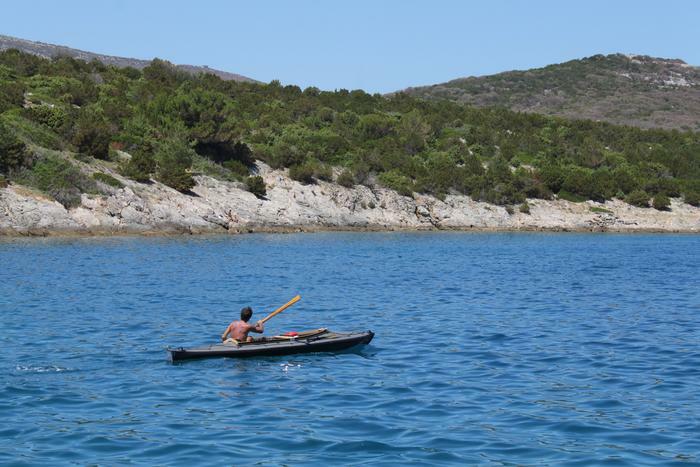 Kayaking has lately become one of the most popular ways to explore the Adriatic coast and its islands. In this shallow boat resembling a canue, the rower faces forward and rows using a twosided paddle at a rate that suits him or her. Of course, since more and more people are interested in kayaking, chances are you'll have to keep up with the ryhthm of your group. The best time to go kayaking is late spring and early fall. It is available on many locations in Croatia, but here we picked the most interesting ones. Kayaking will give your holiday in Trogir a completely new dimension. Active holiday is an ideal way to fully relax and recharge. The path begins by the old mill in Pantana and includes sightseeing from the sea. You get to have a break to grab a bite to eat and swim, depending on your needs and wishes. Total lenght: 6 km. Prvić is an Adriatic island located in the archipelago of Šibenik near Vodice. As it is considered cultural heritage, the whole island is protected by the Ministry of Culture of the Republic of Croatia. The kayaking tour starts on the Vodice beach and then you row along the islands of Logrun and Tijat. You stop a couple of times to take a swim in the clear blue sea. Total lenght: 5 – 10 km. The untouched nature on the very south of Croatia rewards all those who take a kayaking tour from Komiža to Green Cave, Stiniva bay and Blue Cave on the island of Biševo with vistas of unreal beauty. Isolated lagoons and beaches near the town of Komiža are worth taking a look at from the sea. Total lenght: 10 – 15 km.